We thank thee, Steam, for your supreme weekend deals. You want some Trine? Steam's got your Trine... right here. This weekend, now through Monday 10 a.m. PST, you can grab any or all of Frozenbyte's co-op puzzle platform games for 50-85% off. Get 'em, get two friends, then settle in for some fantastic online or local co-op gaming. 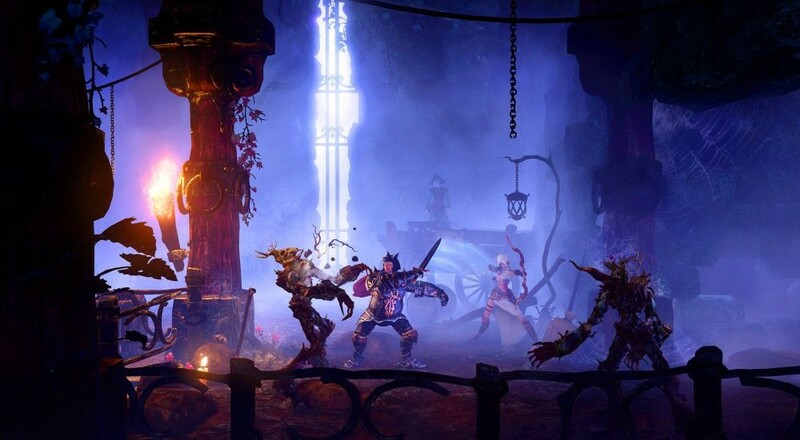 If you don't own any of the Trine games, grabbing the Trinelogy pack is definitely for you. For a paltry $13.99 you'll get your paws on Trine 2: Complete Story, Trine 3: The Artifacts of Power, and Trine Enchanted Edition. Which is all the Trines, in case you were wondering. You can also pick and choose which Trine you want, which is nice since the first two games are 85% off while the still-new Trine 3 is 50% off. Just in case you need a primer on Trine, think of the series as a modern version of The Lost Vikings, complete with its fun sense of humor. Three characters head out on an adventure, each with their own attacks, playing style and special abilities. In order to progress through stages and defeat the enemies, you have to use their skills in concert by switching between characters (or yelling at your co-op buddy to come stab this baddie). It's a swell set-up for a solo player, but when you throw in co-op for up to three people (online, local, or any combination of the two), you've got the makings of an amazing cooperative experience. Now go forth and puzzle solve. You have until Monday morning. Page created in 0.3935 seconds.